Covered a lot of territory today so I’m going to split this up into two separate posts. 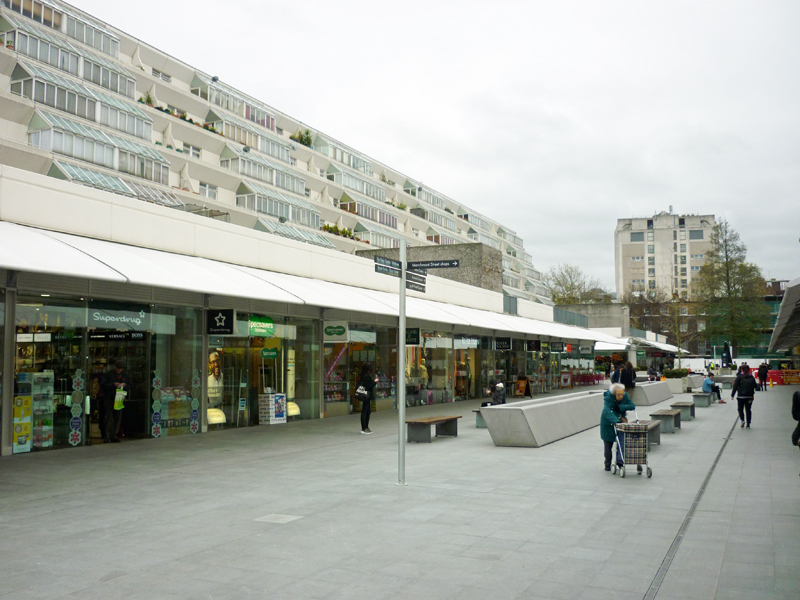 This first one starts near Russell Square tube station then takes in the Brunswick Centre before moving south through Queen Square, east along Great Ormond Street and back west via Theobalds Road to Russell Square itself. As you might imagine this part of town is largely known for the hospitals which cluster together here. 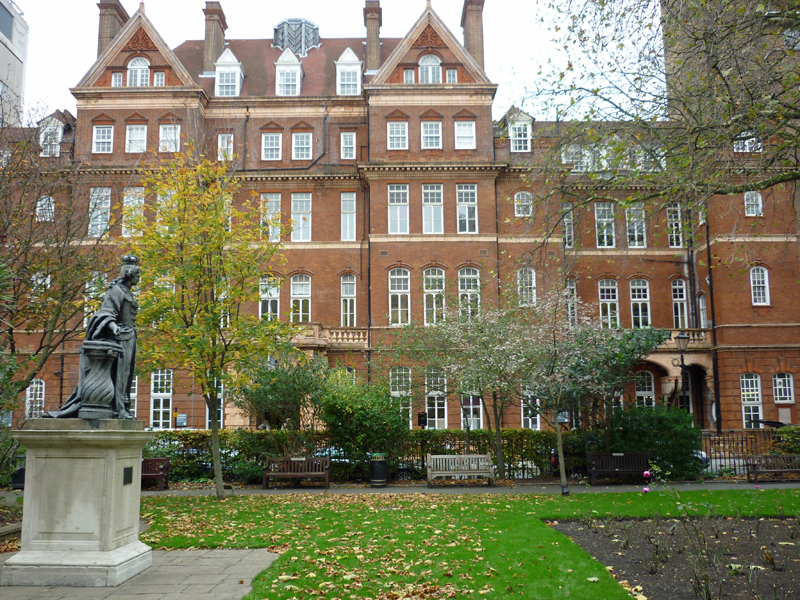 When we move west of Russell Square on the second leg of this walk it’s all about the University of London. 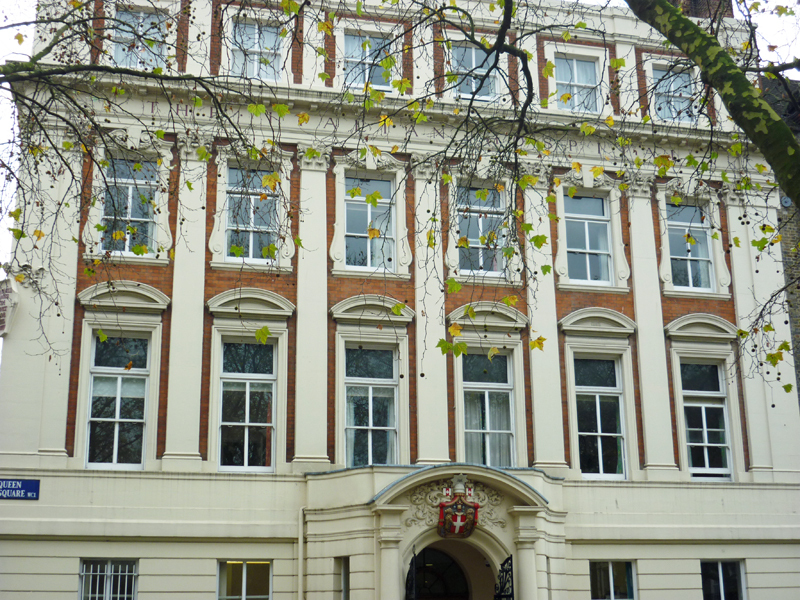 Starting point for today is Woburn Place from where we turn left into Coram Street and then turn south down Herbrand Street. 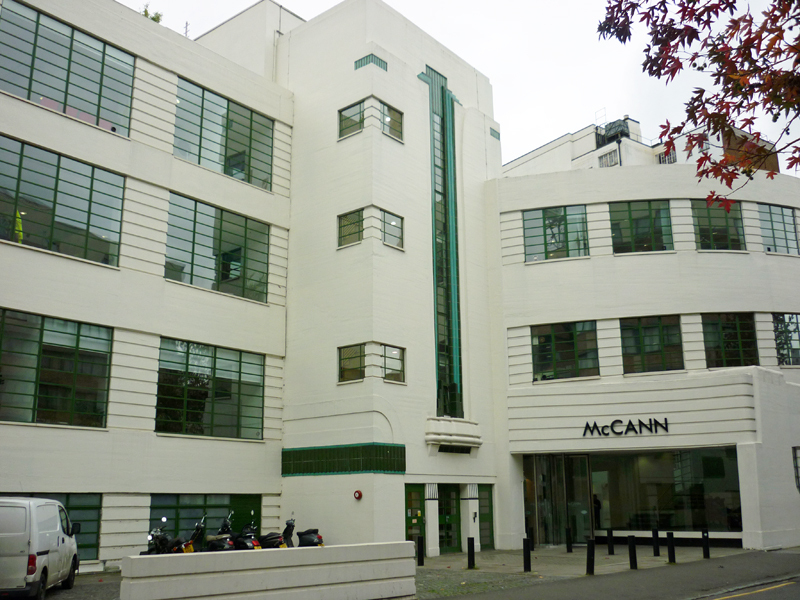 Here on the right, opposite a particularly unlovely Hilton hotel, is the McCann building, a superb example of 1930’s Art Deco created in 1931 by Wallis Gilbert & Partners who were also responsible for the much loved Hoover factory. The building was originally a Daimler car hire garage. 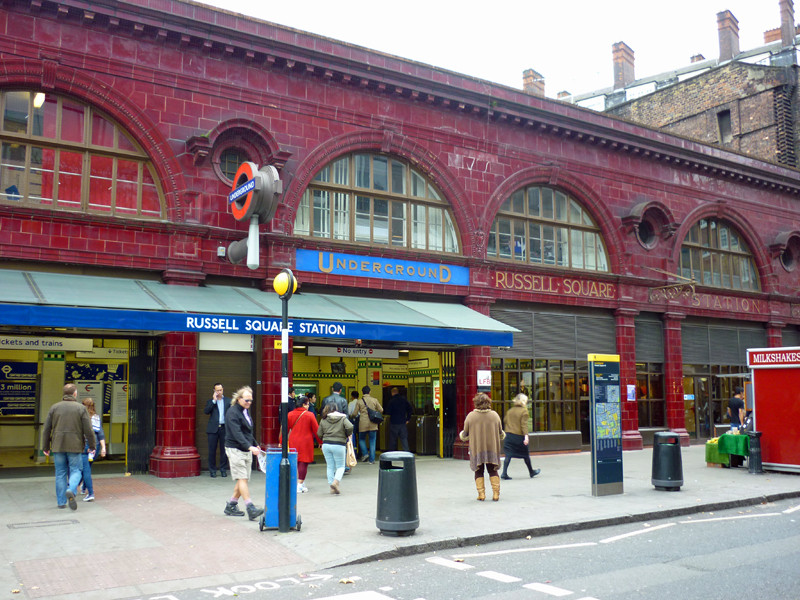 Turning left at the next junction along Bertrand Street takes us past Russell Square station, one of the best examples of the classic Leslie Green-designed underground stations with their iconic claret tiling. 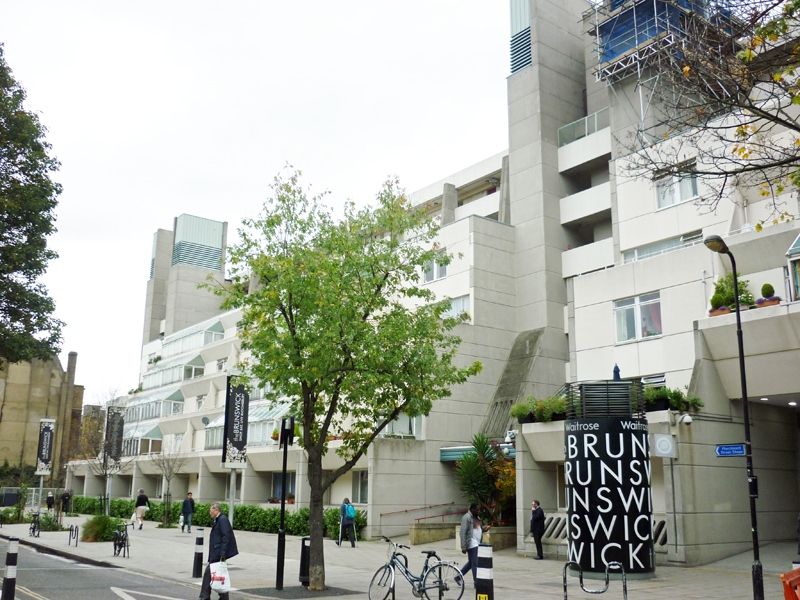 Heading north again, this time on another stretch of Marchmont Street, and from there turn right into the Brunswick Centre, a residential and retail development designed in the 1960’s and finally completed in 1972. It’s one of the few constructions of that era to have achieved Grade II-listed status and still divides opinion. I’m quite fond of it as it reminds me of my first halls of residence at UEA, though by the time I was working near here in the mid-eighties it was already quite tired; with the flavour of a down-at-heel provincial high street. In recent times it’s been spruced up of course and now looks like any generic semi-prosperous high street. I used to frequent the bunker-like cinema on the east side of the square back in the day when it was still the Renoir (fell asleep in Screen 2 during a showing of Tarkovsky’s “Stalker” in 1986). 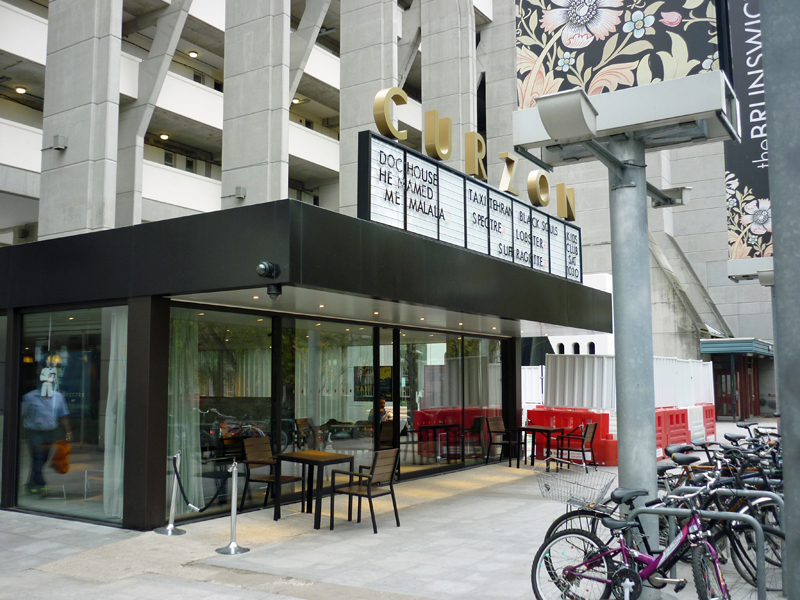 It’s recently been done-up and re-branded as the Curzon Bloomsbury (progress eh ?). 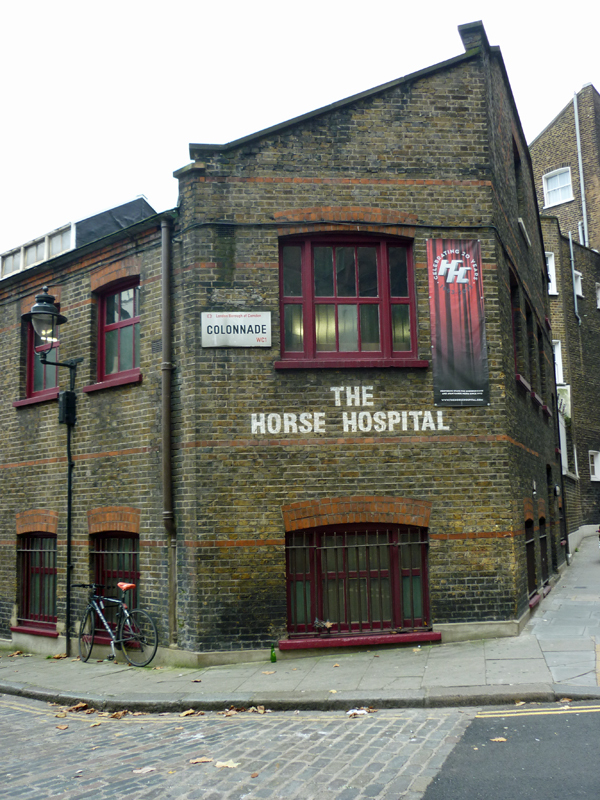 Back past the tube station and hang a left into the final bit of Herbrand Street before reaching Colonnade (our first and for all I know the only example of a one-word named London thoroughfare) on the corner of which sits the Horse Hospital. 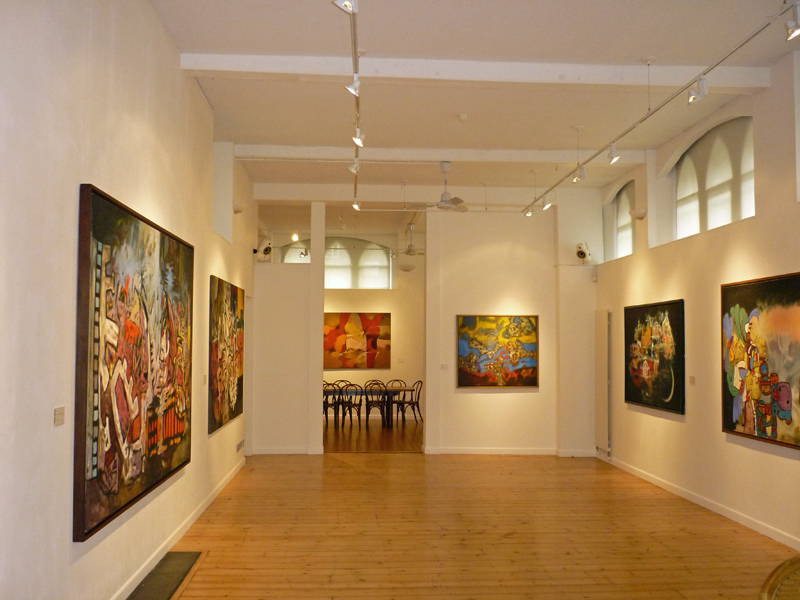 Originally built at the end of the 18th century as a functioning two-storey horse stable it has housed one of London’s most alternative arts venues since 1993. 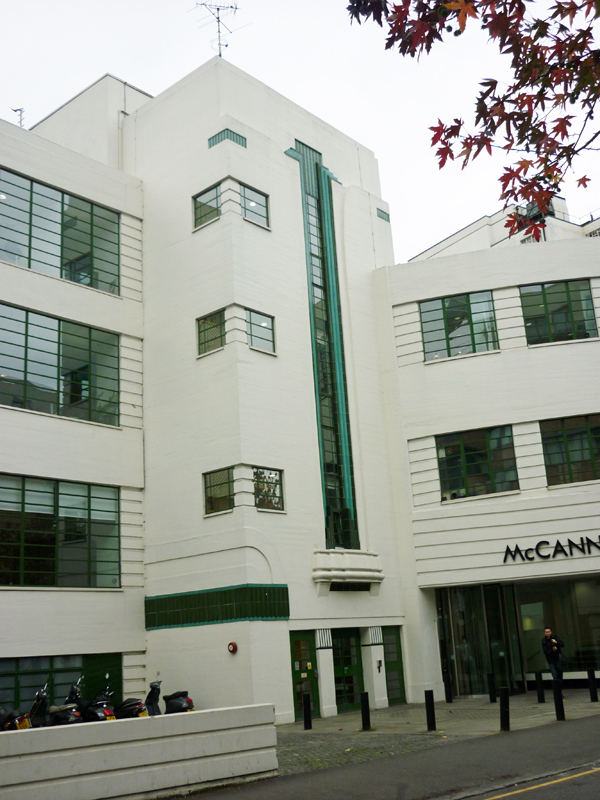 Unfortunately this bastion of the avant-garde and the underground is currently under threat of closure following the decision in 2014 of the building’s owners to put it up for sale (for a cool £2.5 million). 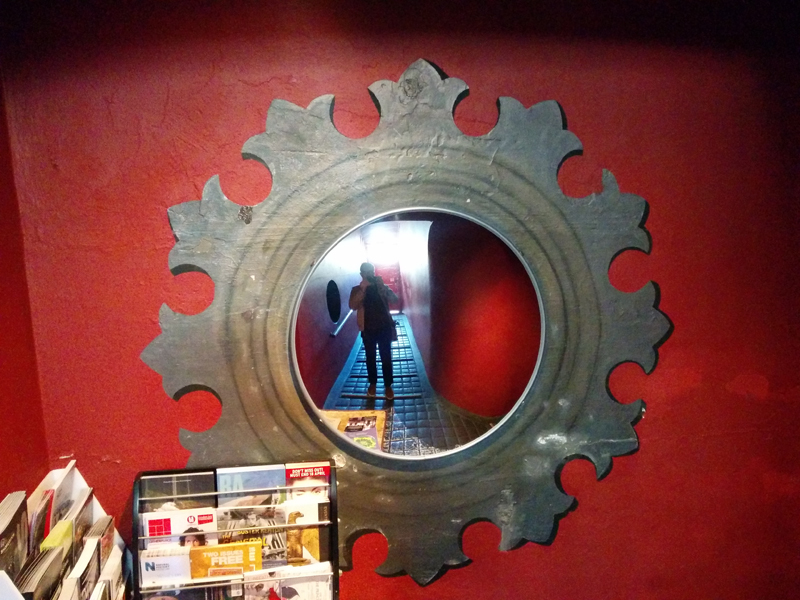 In order to try and safeguard its future the HH has set up a fighting fund and crowdfunding support campaign and is running a number of fundraising events involving artists who have been associated with the venue. Unfortunately the right-hand picture above can’t really count as the selfie-of-the-day as it was taken on a visit earlier this year during Horse Hospital opening hours. After the Colonnade it’s right into Grenville Street and right again back on to Guilford Street. 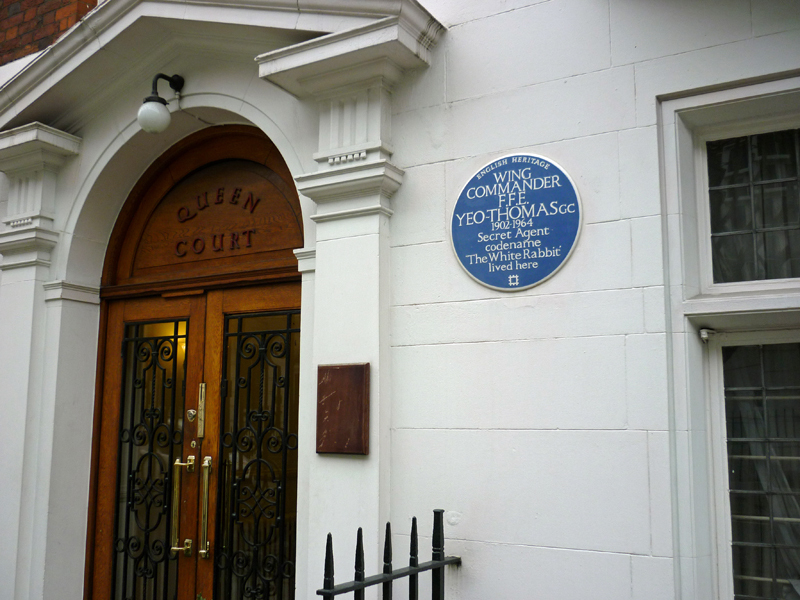 A short way along at Queen’s Court there is a blue plaque commemorating Wing Commander Forest Frederick Edward Yeo-Thomas (1902 – 1964), the British secret agent known as “The White Rabbit“. Recruited by the British SOE during WWII to act as liaison with the French Free Resistance he was instrumental in securing vital support for the latter by appealing directly to Churchill. 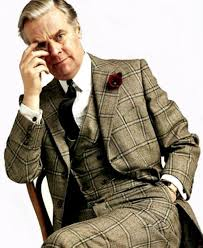 Check out the link and I think you’ll agree that they don’t really make ’em like that anymore (eat your heart out Mr Bond). 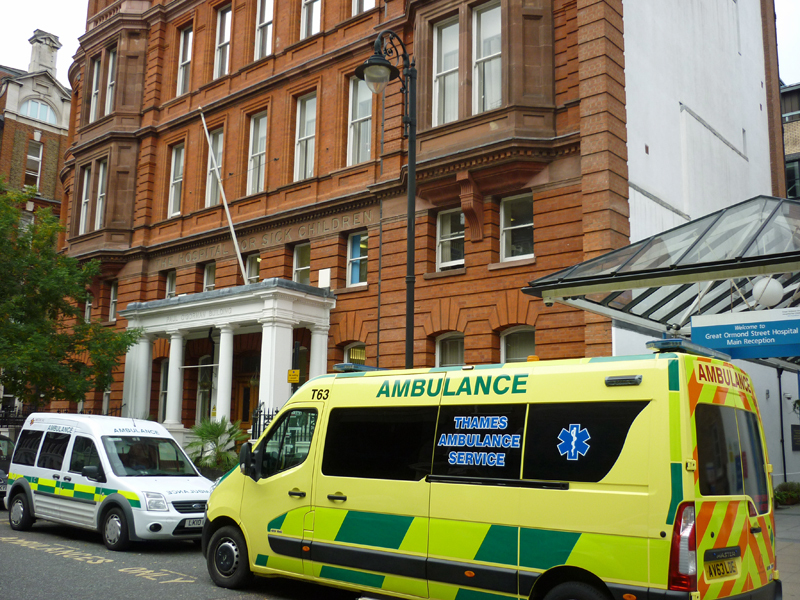 South into Queen Square which is flanked on its east side by the National Hospital for Neurology and Neurosurgery. 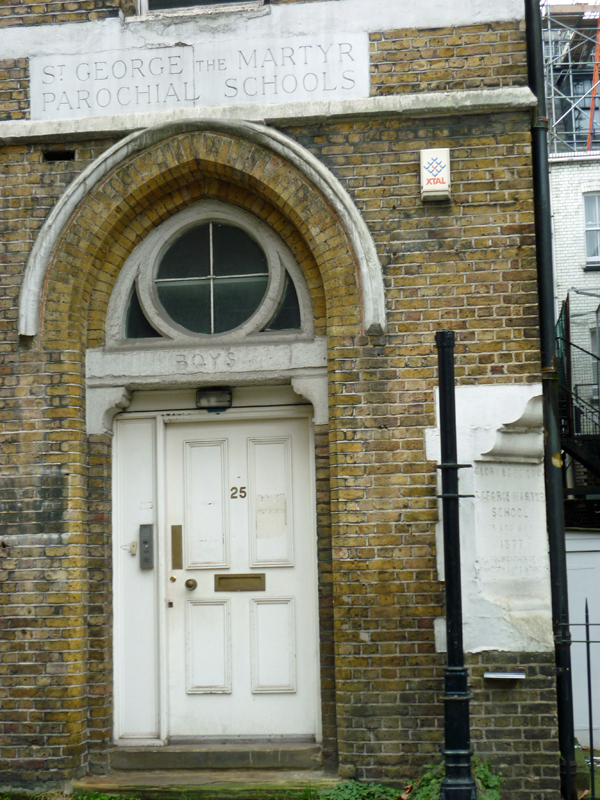 At its bottom end sits the former Italian Hospital which is now part of Great Ormond Street. 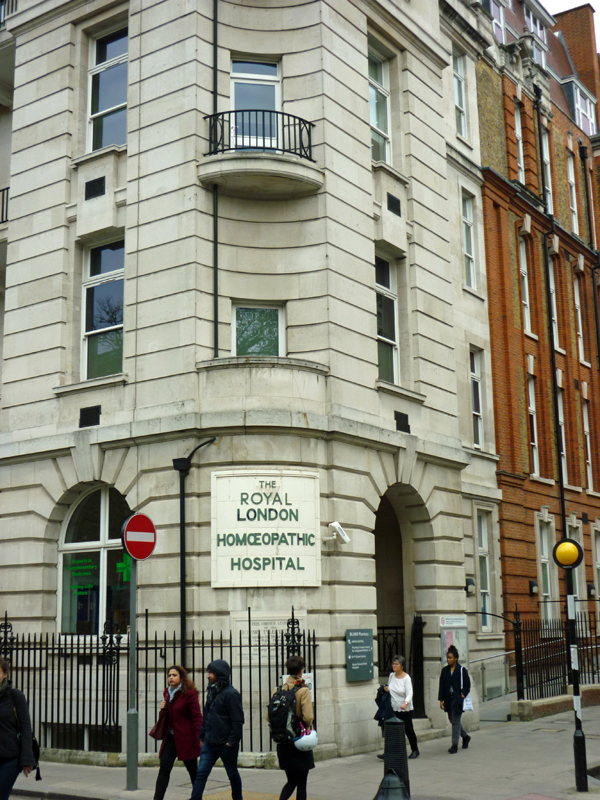 Between the two is the Royal London Hospital for Integrated Medicine which (as you can see from the picture below) was formerly the Royal London Homeopathic Hospital. In light of recent announcements about NHS blacklisted treatments it might need to get on with completing the airbrushing. 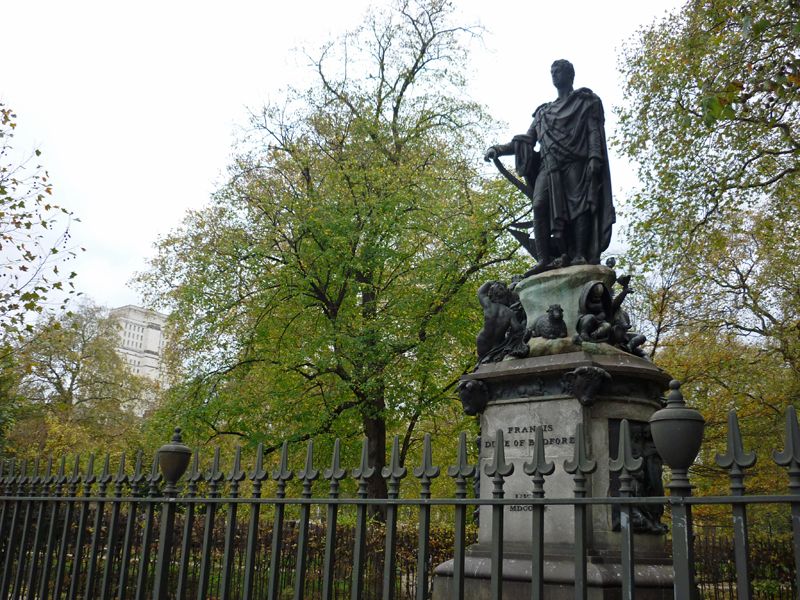 The statue in the gardens is believed to be of Queen Charlotte wife of George III. 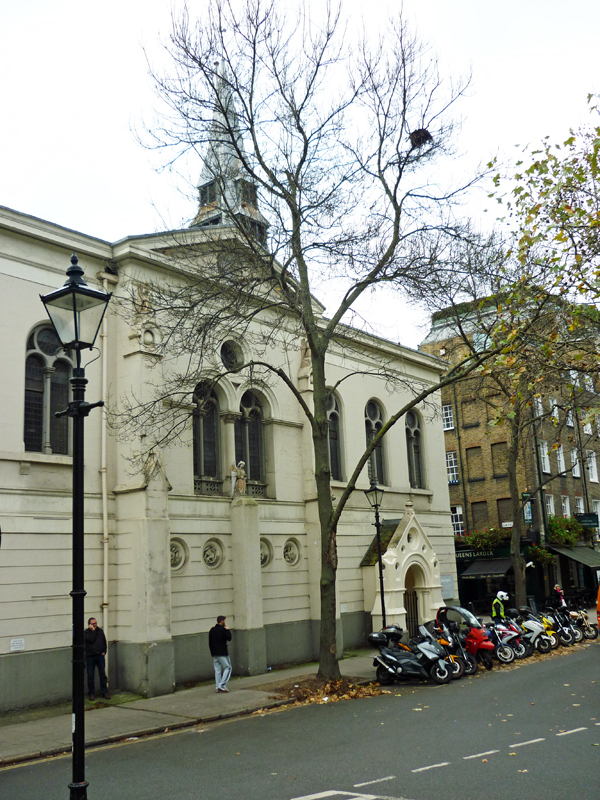 At the South-West corner of the square we find the Church of St George the Martyr, dating back to 1706 (though it has been seriously remodelled at least twice since then). Its major claim to fame is that it played host to the wedding of Ted Hughes and Sylvia Plath in 1956. Adjacent to the church is the derelict site of an eponymous charity school opened just four years after the church. A St George the Martyr C of E primary school still exists nearby having moved to a new-built site in 1976. 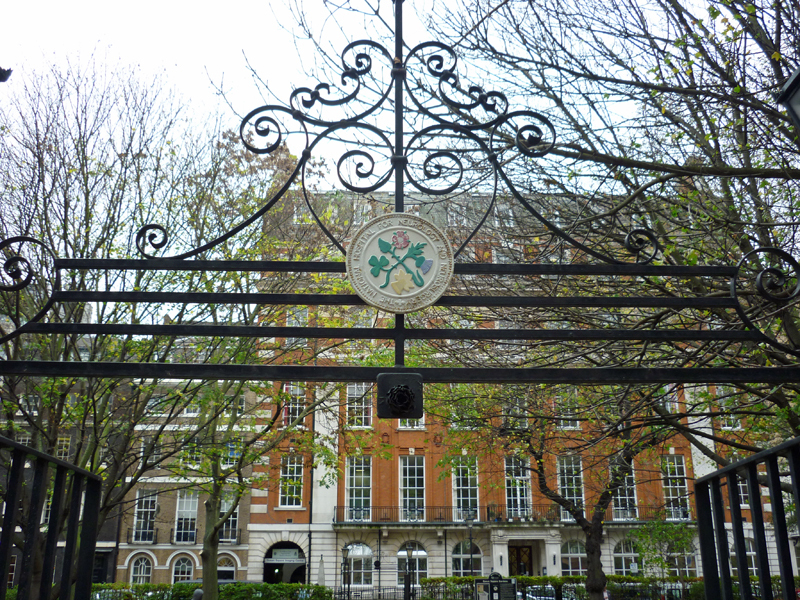 We leave the square via Great Ormond Street itself and pass the main entrance to the world-famous children’s hospital. The hospital first opened in 1852 and, as is well known, has benefitted from ownership of the universal rights to Peter Pan since being given them by J.M Barrie in 1929. This has contributed no-doubt to the many breakthroughs in paediatric medicine that have occurred here – including the first successful bone marrow transplant in 1979. 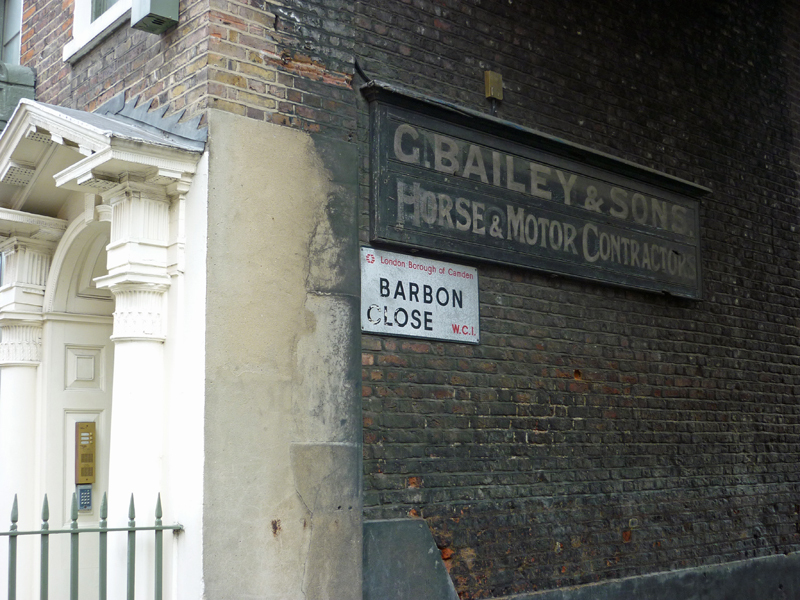 Opposite the hospital at the entrance to Barbon Close is a vestigial sign advertising the presence of G. Bailey & Sons Horse & Motor Contractors a business which sadly closed its doors in 1951. Oddly though a company of the same name was founded just two years ago in 2013 and has its registered office nearby in Theobalds Road. 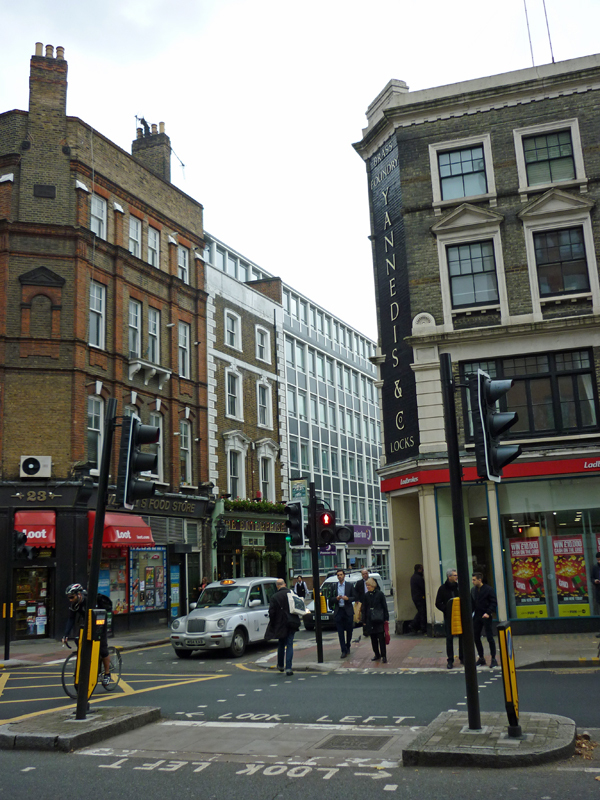 Next up is Lambs Conduit Street with its boutique designer shops and high-end coffee houses. 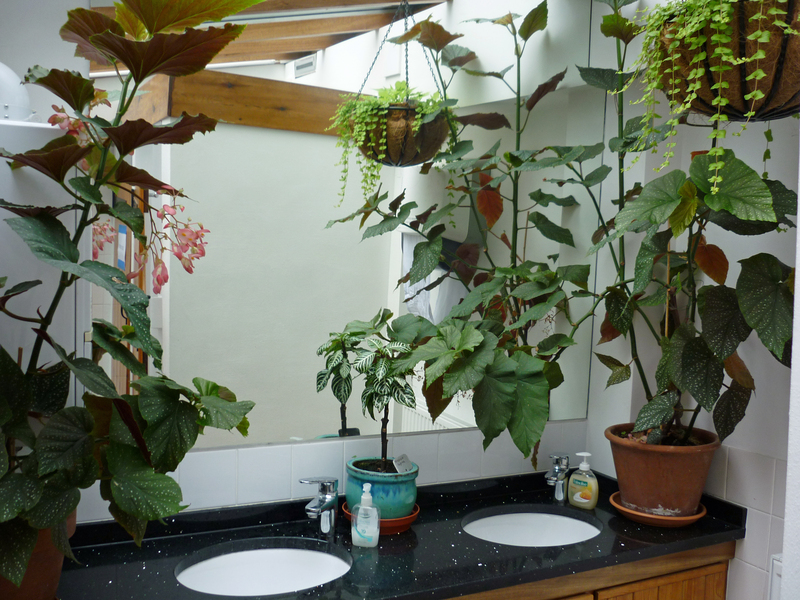 Sadly the public conveniences at its north end where it morphs into Guilford Place rather let the side down. In the background you might just be able to make out the Young’s pub, the Lamb, which has been around in one form or another for the best part of 300 years. 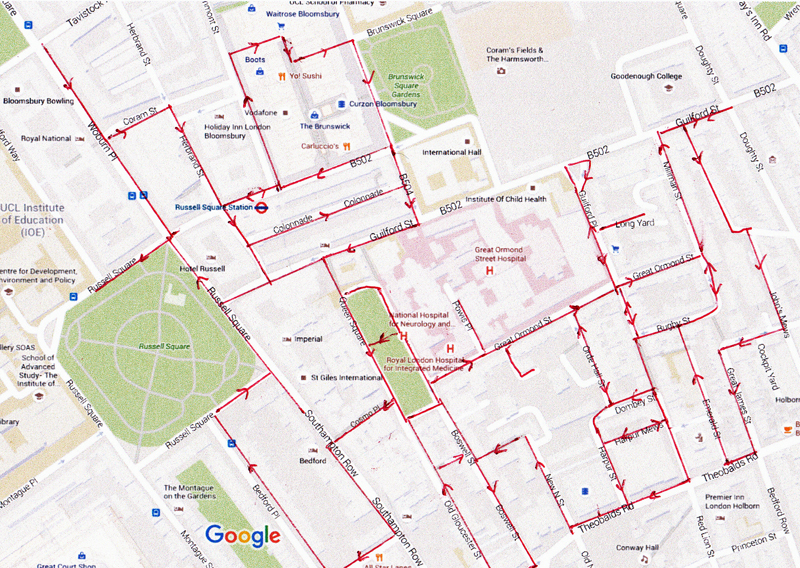 So, doubling back, we check out Long Yard then turn left into the final part of Great Ormond St before going north on Millman Street and then south again down Doughty Mews. 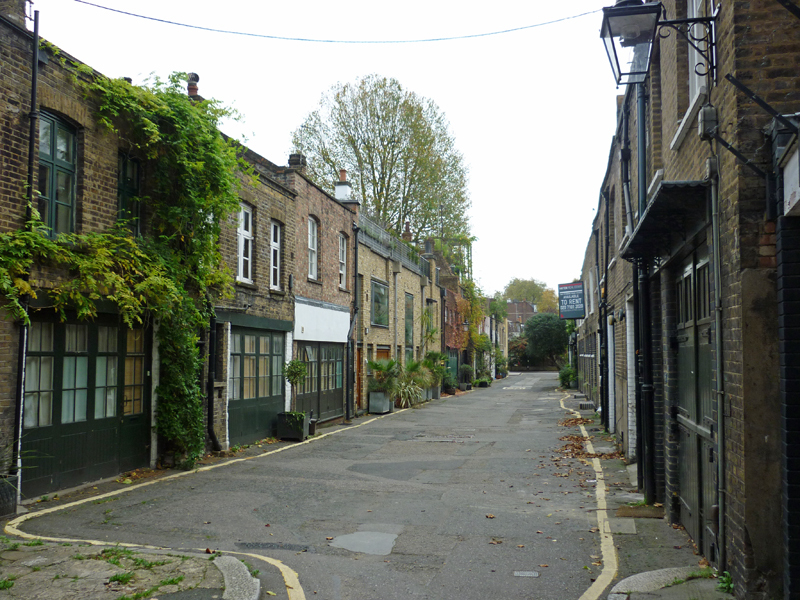 On mews leads to another, John Mews this time, from where we turn right into Northington Street. 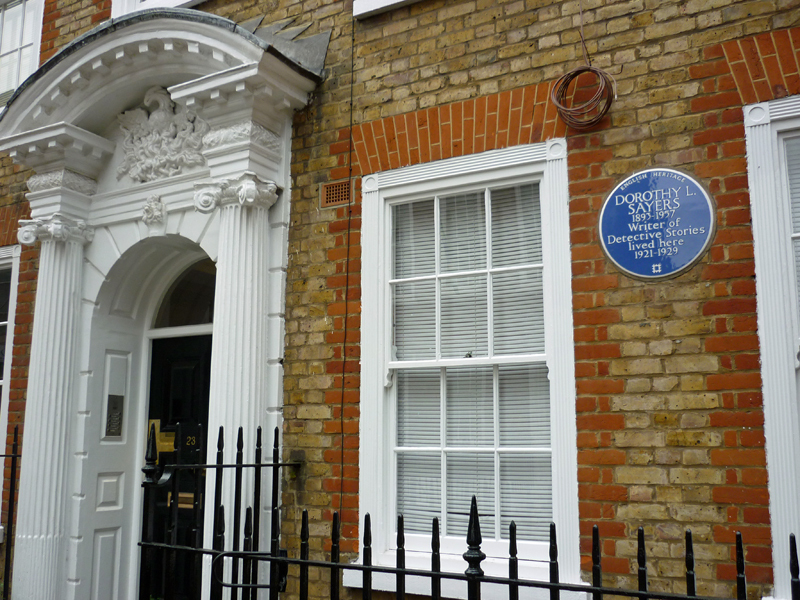 This runs into Great James Street where No.23 was home in the 1920’s to Dorothy L. Sayers (1893 – 1957) one of the queens of detective fiction and the creator of Lord Peter Wimsey, perhaps most famously portrayed by Ian Carmichael on British TV in the early seventies. 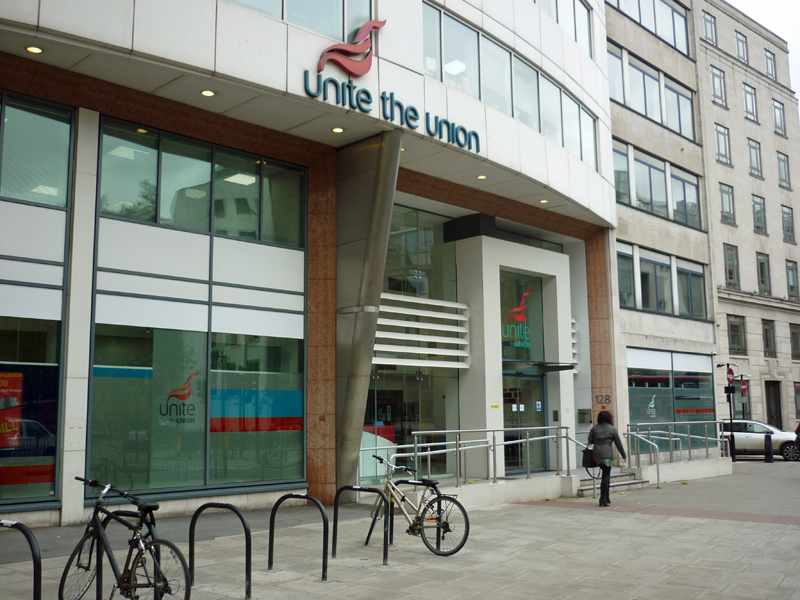 This takes us down onto a stretch of Theobalds Road from where we head north again up Emerald Street and then visit Rugby Street, Dombey Street , Orde Hall Street and Harpur Street before returning to Theobalds Road and passing the London HQ of mega-union, Unite. 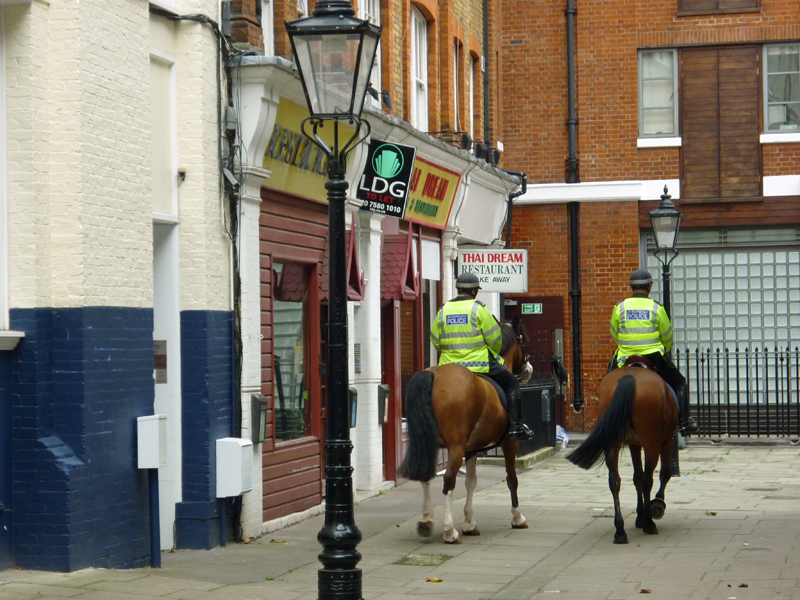 Next up is New North Street at the top of which we turn left into an alley which cuts through to Boswell Street and encounter a couple of mounted policemen on patrol. Gage Street then takes us through to Old Gloucester Street, home to the October Gallery which is not only a commendably internationally-flavoured art space but also has exceedingly nice washroom facilities. We emerge again into Queen Square and quick left into Cosmo Place brings us out onto Southampton Row. Head south until we reach Bloomsbury Place which links up with Bedford Place. 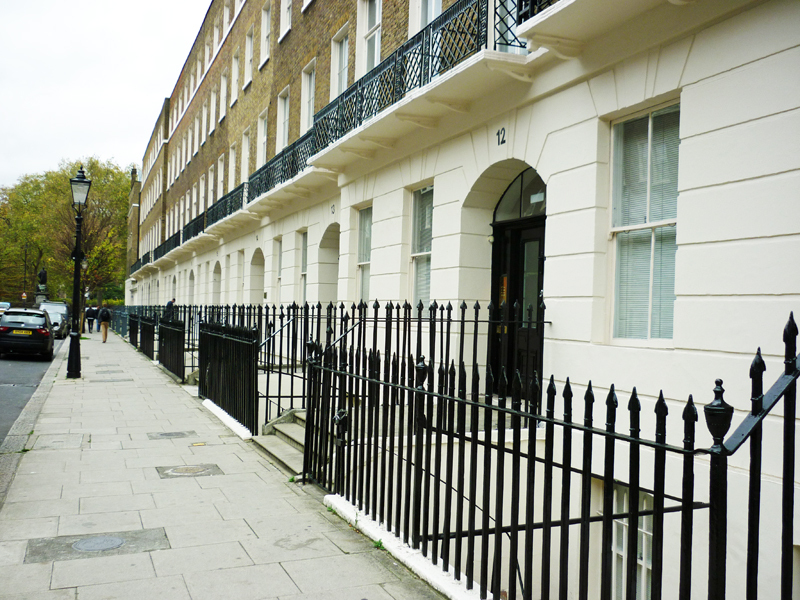 This is one of those streets full of white-fronted, black-railinged townhouses that Hollywood thinks everyone in London lives in. In reality they’re mostly hotels or offices. 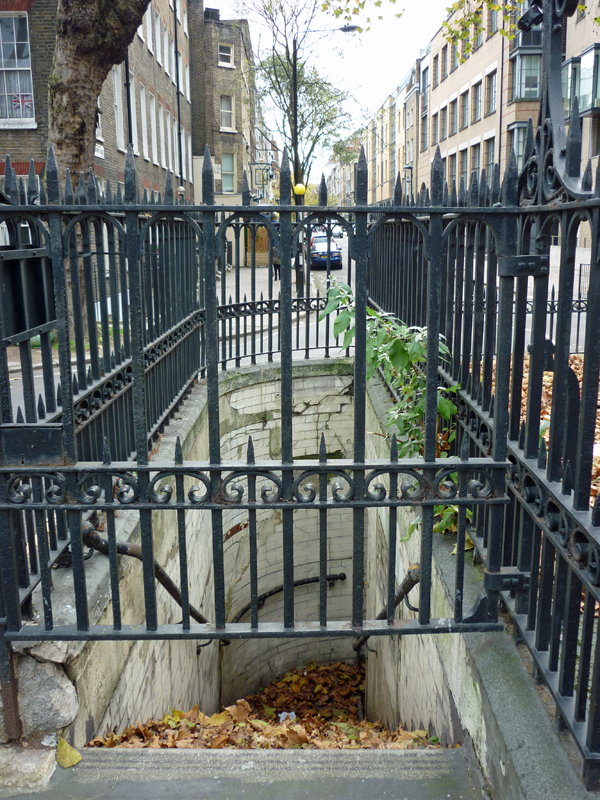 The top end of Bedford Place comes out opposite Russell Square gardens and the statue of the man who commissioned their creation, the fifth Duke of Bedford. And that completes the first half of today’s circuit.